Investigators of the occult. Explorers of the unknown. Purveyors of the impossible. Champions of science. That's what the poster for "H.P. 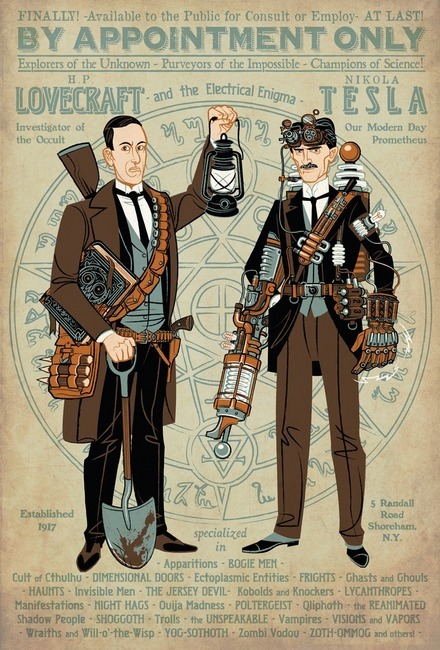 Lovecraft, Nikola Tesla, And the Electrical Enigama" promises us. And to my great and enduring sadness, this brilliant idea is only a poster for now. It was created by Travis Pitts, whose since made it available for sale due to popular demand. But the idea is so fantastic, I hope it morphs into a comic book or a Web series or something like that. And soon! Your wish is granted. Look for "Herald: Lovecraft & Tesla" from Action Lab Comics. Issue #2 was released 2/18/15. Inspired by a Breitling watch five or six years of Replica Watches the twentieth century (when Breitling has become “the world’s aviation industry official supplier”), in order to Replica watches UK clear the modern spiritual heritage of the brand essence of traditional . The most notable feature of handbagreplica Breitling Chronograph aviation in its wide bezel one of Rolex Dayton the most hard synthetic material – made of high-tech ceramics scratch and designed to enhance operational Replica handbags. The idea is fantastic and brilliant! Nice artwork! I like this idea!